At 7-1 with only a road loss to Miami (FL), John Groce has Illinois once again playing well in its non-conference schedule. But one notable difference this year is how improved the Fighting Illini have been on offense. Due to the addition of a couple of offseason transfers, Illinois finds itself with a wealth of combo guards and wings who can score in bunches. While that revamped offense has gotten good publicity thus far, it’s been Illinois’ ongoing successes on the defensive end (91.0 adjusted defensive rating), that has Groce’s squad primed to make a return to the NCAA Tournament. The anchor of that defense, and the only reliable inside presence on the team, is senior big man Nnanna Egwu. Illinois faces #7 Villanova in Madison Square Garden tonight and it will need Egwu to lead the charge in slowing down the Wildcats’ top 15 offense (110.7 adjusted offensive rating). Nnanna Egwu covers for a lot of defensive mistakes for the Illini. Egwu is the lone active senior this year – Illinois’ other senior, Tracy Abrams, is out for the season with a torn ACL – and he is averaging 7.5 PPG, 5.4 RPG, and 1.9 BPG in a shade under 30 minutes per contest. The native Nigerian didn’t start playing basketball until the eighth grade, but his quick development led to significant playing time on Groce’s first team in Champaign. The big man still does not have much of a back-to-the-basket game on offense, but he has nice touch and can step out and shoot from the perimeter (5-of-14 from three this season). Whatever his limits are in scoring, what he brings to Groce’s defense supersedes it. Egwu is one of the top rim-protectors in the country, serving as a safety net for guards who get beaten off the dribble. His presence inside allows Illinois’ guards to be more aggressive and gamble for steals, the proof being the Illini’s top 100 steal percentage (10.8%) despite not having the prototypical athletic and long players that dominate this category. 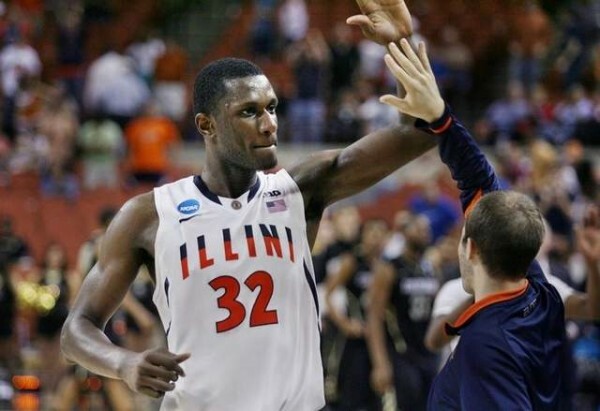 When the Illini play Villanova tonight at Madison Square Garden, Egwu will have his hands full guarding 6’11” center Daniel Ochefu, who converts on 63.6 percent of his attempts near the rim. In addition to Ochefu, he’ll also have to act as the eraser if Wildcats’ guards Darrun Hilliard and Dylan Ennis penetrate the lane to get to the bucket — where both are also shooting over 60 percent. With no capable replacement on the bench, Egwu must avoid fouling to stay on the court, otherwise it’ll be open season on the Illini inside the paint (Egwu to this point has avoided a disqualification on fouls this season). Illinois has relied on its center to provide a foundation to its high-quality defense, and to have any chance of walking out of the Mecca with a Top 10 scalp tonight, it will fall on Egwu to answer that call once again. This entry was posted on Tuesday, December 9th, 2014 at 4:55 pm by Alex Moscoso	and is filed under big ten, microsites. Tagged: aaron cosby, Ahmad Starks, Daniel Ochefu, darrun hilliard, dyaln ennis, illinois, illinois fighting illini, john groce, nnanna egwu. You can follow any responses to this entry through the RSS 2.0 feed. You can leave a response, or trackback from your own site.